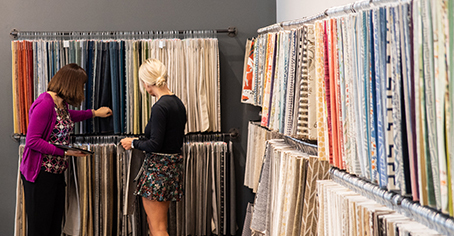 Applies to purchases made with your Boston Interiors credit card from April 1 - 30, 2019, if paid in full within 36 months in equal payments. No minimum purchase required. Finance charges will be waived when full payment is made within 36 hours of delivery. Plus, earn a $50 prepaid VISA gift card. Please Note: If financing a special order, a 30% deposit by other form of payment is required. 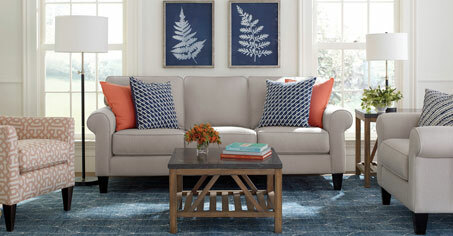 Purchases made with your Boston Interiors credit card require a $999 minimum purchase. Clearance and closeout items do not qualify towards meeting the $999 minimum purchase. Interest will be charged to your account from the purchase date if the promotional balance, including optional charges, is not paid in full within 12 months or if you make a late payment. Minimum monthly payments required. Account fees apply. Purchases made with your Boston Interiors credit card will accrue interest from the purchase date if the promotional balance, including optional charges, is not paid in full within 6 months or if a late payment is made. Minimum monthly payments required. Account fees apply. When can I expect my first bill? 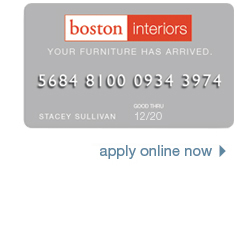 Purchases on a Boston Interiors credit card are not processed until the date of delivery. Monthly statements are generated by Synchrony Financial and will vary depending on the date of your delivery. Can I make a payment at any of the Boston Interiors stores? Payments are not accepted at Boston Interiors store locations. Please refer to your monthly statement for the payment address or visit www.mysynchrony.com to pay your bill online. Boston Interiors cardholders can contact Synchrony Financial at (866) 396-8254 or visit www.mysynchrony.com with any account questions. May I apply the financing to an online purchase? Not at this time, but please check back as this may change. *No interest will be charged on promo purchase if you pay the promo purchase amount in full within 36 months. Equal monthly payments are required equal to initial promo purchase amount divided equally by the number of months in promo period until promo is paid in full. If you do not, interest will be charged on the promo purchase from the purchase date. The monthly payment will be rounded to the next highest whole dollar and may be higher than the minimum payment that would be required if the purchase was a non-promotional purchase. Regular account terms apply to non-promotional purchases. For new accounts: Purchase APR is 29.99%; Minimum Interest Charge is $2. Existing cardholders should see their credit card agreement for their applicable terms. Subject to credit approval. Delivery must be taken within 90 days of purchase. Visa rebate valid for new accounts only. Qualifying purchase required. See store associate for details. **If promo and debt cancellation are not paid in full within 12 months, interest at APR 29.99% will be assessed from purchase date. If account goes 60 days past due, promo may be terminated early and accrued interest will be billed. As of January 1, 2011, Purchase APR 29.99%; Penalty APR 29.99%. Monthly Maintenance Fee $.99 each month account has balance. Minimum Interest $2. Existing cardholders refer to your current credit agreement for rates and terms. Subject to credit approval. *** If promo and debt cancellation are not paid in full within 6 months, interest at APR 29.99% will be assessed from purchase date. If account goes 60 days past due, promo may be terminated early and accrued interest will be billed. As of January 1, 2011, Purchase APR 29.99%; Penalty APR 29.99%. Monthly Maintenance Fee $.99 each month account has balance. Minimum Interest $2. Existing cardholders refer to your current credit agreement for rates and terms. Subject to credit approval.